Place rabbit pieces into a large pot, cover with chicken stock and bring to the boil. Simmer for 3 hours.
. Let the meat cool and de-bone. Cut rabbit meat into small pieces. 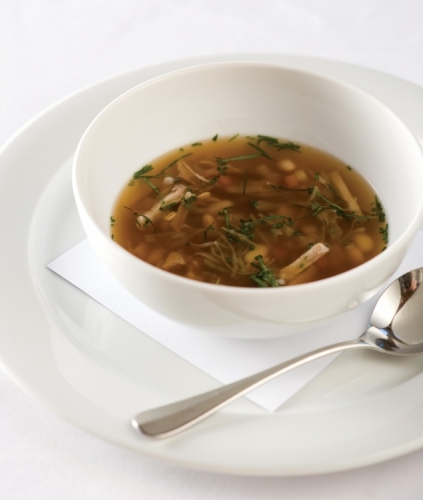 Bring stock to simmer and add vegetables, white beans, barley and thyme. Cook for 3 minutes. Add the Italian Almond Tea and infuse for 3 minutes. Remove tea bags and thyme. Add rabbit meat, chives and parsley. Divide evenly into 6 bowls and serve with crusty bread.